Jilliane Hoffman certainly isn't the first crime fiction author to use the Internet as a device for child predators to pick up victims. 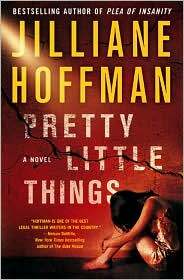 However, her novel, Pretty Little Things, brings a different perspective to the issue since her primary character, Florida Department of Law Enforcement Special Agent Bobby Dees, is the father of a missing child himself. Bobby Dees and his wife know the agony of the parents of those children, and Hoffman brilliantly portrays a father, who is also a cop. It's a powerful, frightening story. And, Dees isn't just any cop. Dees heads the Crimes Against Children Squad in Miami, so every day he faces the reality of what could have happened to his daughter, Katy. He hasn't slept in the year she's been gone, and berates himself for what he could have done. But, his colleagues call him "The Shepherd" for a reason. He brought kids home, dead or alive. He just hasn't been able to bring his own daughter home. That doesn't mean he's given up on other cases. When thirteen-year-old Lainey Emerson doesn't come home from school on a Friday night, Bobby suspects she's more than a runaway. And, the messages and pictures left on her computer indicate she wanted to appear older for some male she met online. Despite the appearances of her family life, Dees digs deeper. When a TV journalist receives chilling paintings of girls that had been missing, Dees fears the worst. There's a serial predator out there, who may have abducted a number of young teenage girls. And, Bobby knows, "With child predators, often you opened your investigation with one victim and ended it with a few dozen." It's up to him and his fellow agents to find the online predator, and bring those girls home. But, the killer knows Dees is on the case, and his communications with the TV station are a message to Dees, a challenge to find him before he kills again. With Bobby Dees, Jilliane Hoffman puts a face on parents who lose children. Hoffman gave her character a job that puts him in contact with those parents on a daily basis, but his own situation puts the human face on it. He doesn't like to be called "The Shepherd," because he hasn't been able to bring all those children home, and that's why he doesn't sleep at night. Hoffman paints a picture of his grief, "Hope ripped out of your chest." In Bobby Dees, Hoffman has given readers a hero that isn't bigger than life. Instead, he's a father, aware that to online predators there are numerous chances to contact Pretty Little Things. FTC Full Disclosure - Hoffman's publicist sent me a copy of the book, in hopes I would review it. Sounds like a great book, even though when I read about crimes against children my blood boils. Hopefully you can do the same for another book blogger. This one is definitely going on my list. I read the guest post by the author yesterday. The things she talked about are really frightening, but I know they are true. I can't say that I think I'll "enjoy" this book, but I'm sure it will be very compelling. Thanks for the review, Lesa! Wow! Can you imagine how difficult it would be to investigate crimes like that if you had a missing child? Sounds like a real page turner. Thank you, Man of La Books! I appreciate it. You're right, Kay. They are frightening, but, knowing the author's background, I'm afraid they're real. It is a compelling book. Pretty Little Things is a pageturner, Kathy. It would be difficult to continue working on that team if your own daughter was missing. Glad to see you liked it so much..I have my copy sitting on the shelf waiting for me..now I can't wait to get to it. Despite the subject matter, Kris, it was a very good book. Glad you thought so, Lori, and thanks for commenting about it!